The other weekend John bought a Kinect for the Xbox. You seriously have to get one if you have an Xbox. No controllers, it recognizes your face to log you in and it gets all your movements - hands, feet, legs. It's awesome. Friday night John had a late night hockey game. I didn't go because I was pretty tired. Well. I ended up playing Dance Central for about 2 hours straight. I'm not kidding. I worked up a sweat doing it too so that's a plus! 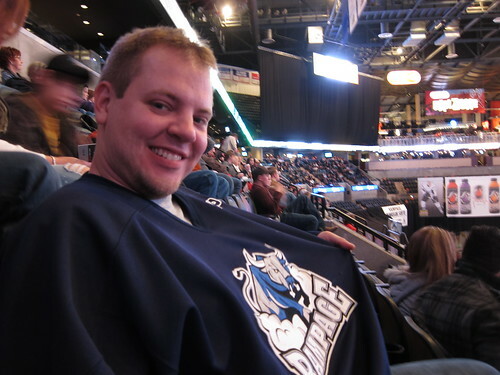 Saturday night I made a deal with John that if I went to the Rampage game with him he'd have to take me to dinner and a movie of my choice the following night. Deal. 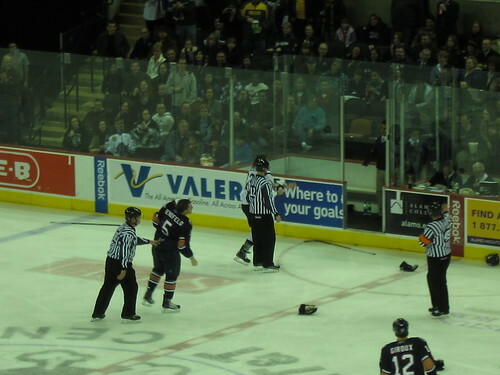 It was the weirdest hockey game ever. During the first break for entertainment they had Belly Dancers. 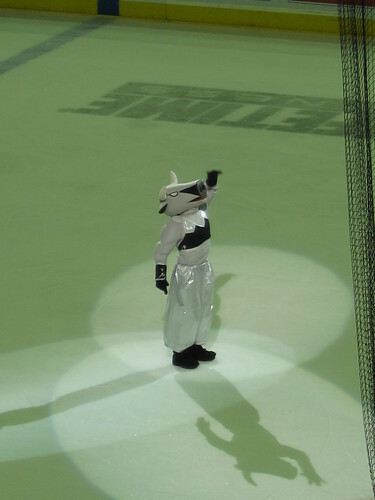 Then at the second break T-Bone, the Rampage mascot, came out dressed as a belly dancer and did a little dance just for fun. 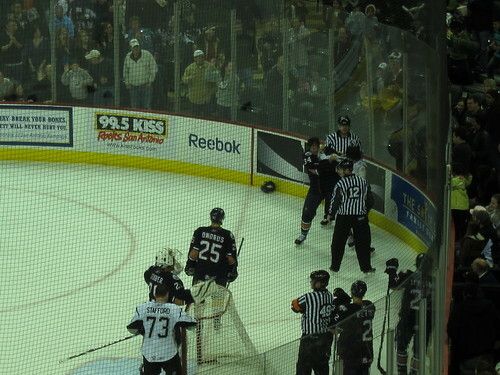 Otherwise there were no points scored and not fights until the end of the last period. There was one small fight towards the beginning. 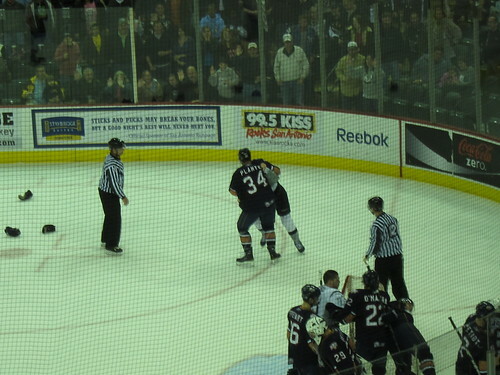 It went on for awhile and the Rampage player was actually ejected from the game. Good way to end the game even though we lost. Sunday day I had to work. Then we had dinner at Trilogy. It's the only place that I can find somewhat similar to actual Chicago Deep Dish pizza. We also saw How Do You Know which kinda sucked big time. 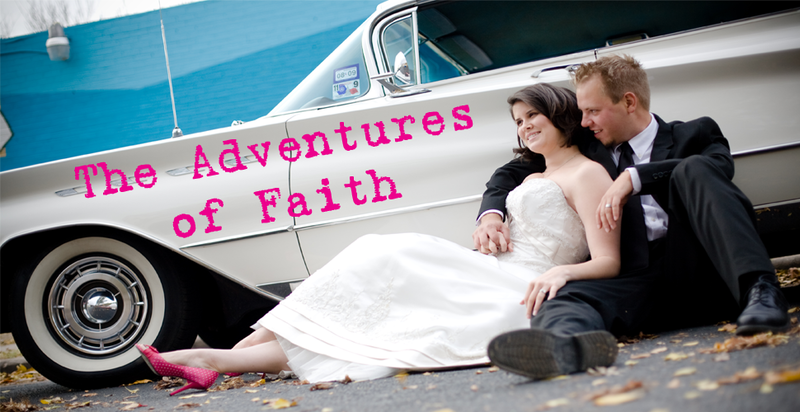 Poor John suffered through it and at the end I was kind of left with a, "Really? That's it? What the hell was the point of that whole movie?" Monday I bought a ridiculous amount of yarn, as well as knitted a couple of random washcloths. 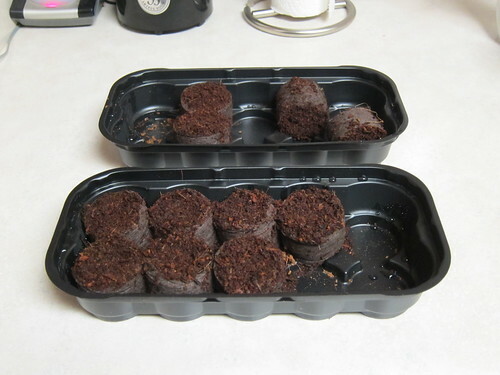 I also started my seeds on Monday. The bottom tray are the jalapenos and Roma tomatoes. I haven't gotten my Park Seed order in just yet. I'm a little worried because my order confirmation and my shipment confirmation had different seed packets on them. I'm really hoping they haven't screwed up my order. How was your three day weekend? So glad to hear another review of "How Do You Know". I was so tempted to go see it because of Reese Witherspoon. Is it worth a rental though? The belly dancing at the hockey game is HILARIOUS. If you buy a Kinect, it doesn't work unless you buy Kinect games too, right? I would maybe rent How do you Know. Just don't expect much from it at all. It also wouldn't be my first choice rental. More like a rainy day, bored & absolutely nothing is on TV. I really wanted to like the movie but it was a total fail. Yep. Gotta have a Kinect game. I hope we can find some used ones in a few months. That's the only crappy part to owning a new gaming system - expensive games. It comes with Kinect Adventures which is acrually fun. We bought Sports which may become a game for the Olympics in July cuz there's a great team play option. I love the dance one & it really is a good workout. I also want Yoga but will wait for the price to come down.